For other uses, see Bantam. A bantam (Indonesian: Ayam kate) is any small variety of fowl, especially chickens. 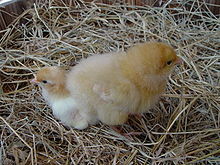 Most large chicken breeds have a bantam counterpart, sometimes referred to as a miniature. Miniatures are usually one-fifth to one-quarter the size of the standard breed, but they are expected to exhibit all of the standard breed's characteristics. The name bantam is derived from the city of Bantam—currently known as "Banten Province" or previously "Banten Residency"—once a major seaport, in Indonesia. European sailors restocking on live fowl for sea journeys found the small native breeds of chicken in Southeast Asia to be useful, and any such small poultry came to be known as a bantam. A true bantam has no large counterpart, and is naturally small. Such birds are often popular for show purposes. The local list of true bantams can vary between nations and regions due to the availability of the breeds and disputes over what qualifies. Bantam chicken eggs are only about a third to half the size of a regular hen egg. Bantams have become increasingly popular as pets as well as for show purposes because they are smaller and have more varied and exotic colors and feather patterns than other chickens. Breeds such as the Sebright, Dutch, and Pekin are popular show birds, and are true bantams. This page was last edited on 15 April 2019, at 17:31 (UTC).